Summer in Boca Raton, Florida is all about enjoying some fun in the sun. We all love a beach day or a good pool party, but participating in some of these activities can cause some havoc on not only your hair cut, but your hair. In the summer, your hair is exposed to more UV rays and drying elements such as salt water and chlorinated pool water, especially in Boca Raton, FL. These factors can cause frizz to have a field day, which is amplified if you also use heat styling tools. The trick to avoiding this summer hair madness is to treat your hair to some TLC on a weekly basis. 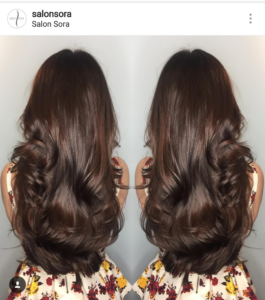 At Salon Sora, we offer several deep conditioning treatments to keep your hair cut in tip-top shape all summer long in Boca Raton, FL. Treatments such as Olaplex or Huille d’ales from Phyto of Paris. We also have products that you can take home to maintain the integrity of your hair cut. All of our hair care lines offer at home treatment masks. Goldwell, Davines, Phyto, and Obliphica all have amazing moisturizing, frizz fighting treatments. Another at home treatment option that our professional stylists recommend to their clients are DIY hair masques. Did you know that many of the ingredients that you keep in your kitchen can also be used keep your hair healthy? For example—coconut oil. You’ve probably heard of all of the amazing uses for coconut oil, but did you know that it’s also one of the few oils that has a molecule small enough to penetrate into your hair to provide deep moisture? It’s true. That’s just one of the household ingredients that can be used as a treatment for your hair. We’ve whipped up a recipe for a frizz-fighting hair masque that will help you repair your hair while adding moisture to your mane and we’re excited to share it with you today! Directions: Start by mix all ingredients into a bowl. Once you have thoroughly mixed all of the ingredients, gently work the mix into your strands starting from the ends of your hair, and working your way to the roots. After distributing the mix into your hair, place your hair into a disposable shower cap and allow the masque to absorb into your hair for 15-20 minutes. For maximum results, allow the masque to sit in your hair while you are taking a hot shower or sitting by your pool. The warmth of the shower or the sun will help to open the hair follicle allowing the treatment to penetrate deeper into your hair. When you are ready to take off the masque rinse the mixture from your hair and follow with your normal washing/conditioning routine. Have you tried making an at-home hair masque? What ingredients do you put in your masque? Let us know by commenting below.